All-On-Four allows you to skip the dentures and improve your smile with permanent & natural looking results! All-On-4 Implants Can Give You New Teeth In A Day & Enhance Your Smile! 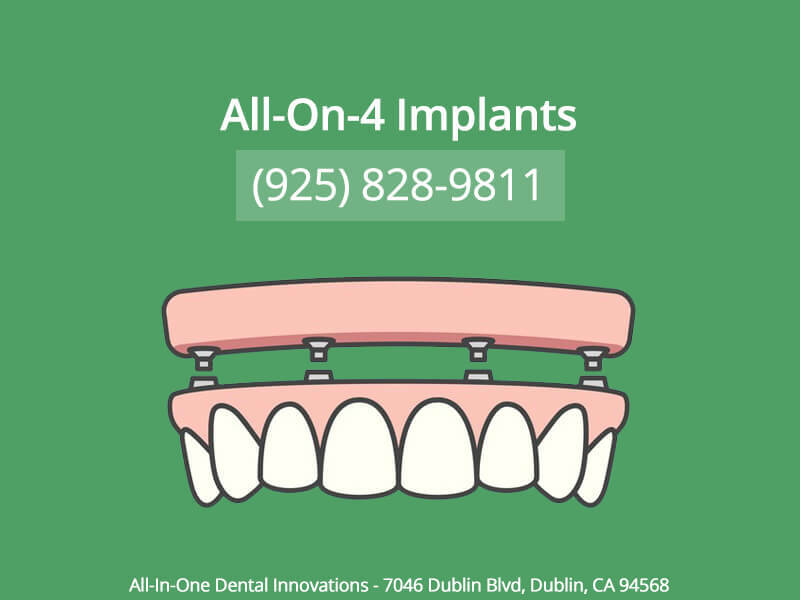 Our Dublin dental office is pleased to provide treatment options to restore the function and appearance of a patient’s smile including All-On-Four implants. All-In-One Dental Innovations is here to help patients achieve fantastic results, for a more permanent solution to missing teeth. The All-On-Four dental implants are designed for those that have lost or have had to have extracted the top, bottom, or both arches of teeth. Our greatest satisfaction comes from having our patients excited about their results. When a patient comes in with concerns about their smile, and we can provide treatment solutions that will exceed their expectations, is something we strive for. 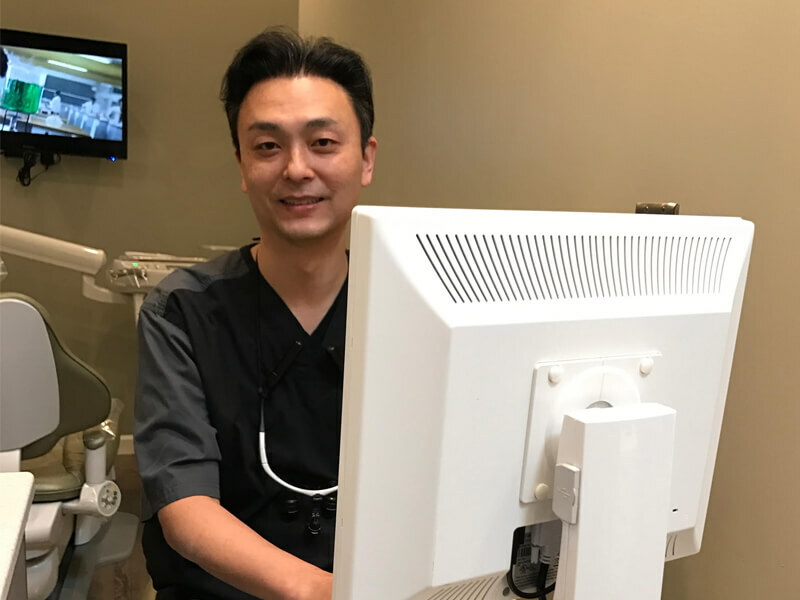 Dr. James Huang has a primary focus on dental implants as well as pain-free dentistry, for best possible patient care. 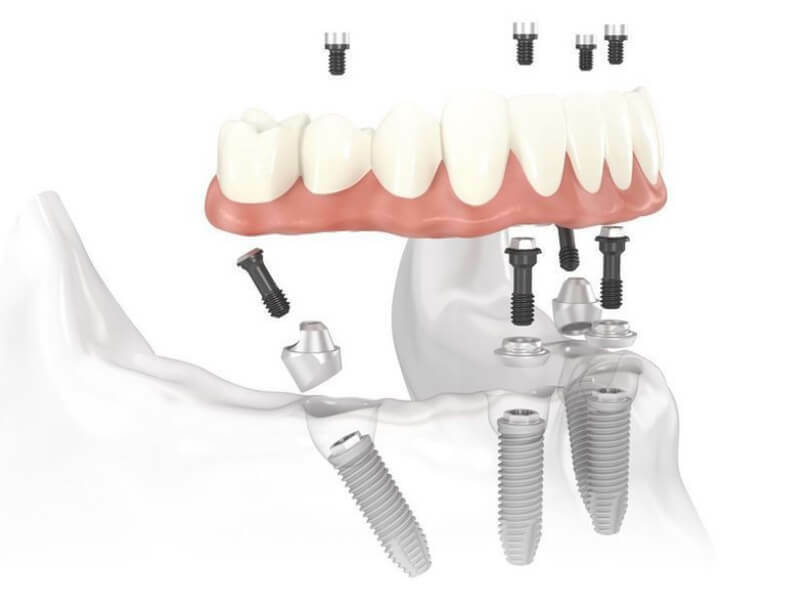 With the All-On-Four implants, it is not only a more permanent way to affix bridges or dentures but can also be a more affordable solution than individual implants. Regain your smile in just one day. Only four implants needed for a full smile. A secure implant placed deep in the jawbone, will not shift or loosen. Affordable, when compared to individual implants with crowns or bridges. More freedom to eat what you would like without the worry. The implants are titanium screws that are surgically placed deep within your jawbone to provide support for dental fixtures like dentures. They are a great alternative to traditional dentures and can offer a complete smile in just one day. While there are some fantastic benefits with All-On-Four implants, they aren’t for everyone. If you are wondering if they would be a great alternative to traditional dentures, we are more than happy to answer any questions you may have about the procedure, what to expect as well as the cost. Losing teeth is never a delightful experience. It can be difficult to eat the foods you love, your facial appearance may have changed, and your speech may be different. Some find that having dentures, while does solve the problem of missing teeth, cumbersome. The concern that you can’t eat the what you would like alone is enough to make anyone not so enthusiast. There are many reasons that you should consider replacement teeth or more specifically dental implants. Regaining confidence and improving the appearance of your smile is among the top reasons to do so. Imagine never having to worry about your dentures falling out. For instance, that moment when the glue becomes lose and the dentures slowly separate and you quickly need to excuse yourself the restroom. Even when around friends or family it can make you self-conscious. With implants, you will never have to worry about these types of embarrassing moments. Dental implants, because it only takes one surgery, one day, you can completely change how you live with tooth loss. We are pleased to offer this service and look forward to helping you complete your smile with a more comfortable and easy way to keep your dentures in place. As the Dublin dentist of choice for dental implants, we are proud to offer this fantastic service to our patients. During your consultation, we will go over what to expect from the procedure, answering any questions you may have. Dr. Huang will listen to your concerns and help you understand everything you need to know about the method and what it will be like living with implants. Our promise to you is we will strive to exceed your expectations for patient care and results. Contact Our Dublin Office Today To Learn More About What All-On-Four Can Do For You! Yes, you can get a smile you can be proud of! It only takes one surgery, and you can have a full smile that you never have to worry is going to fall out. As your Dublin dentist for a dental implant, we would be glad to help you achieve the results you are looking for. Get a beautiful, complete smile faster than ever. So what are you waiting for? All-In-One Dental Innovations can help you regain confidence and improve the appearance and function of your smile. We make it easy to schedule a consultation with our dental team. You can either make an appointment online using our secure form or give us a call at (925) 828-9811.